The Wailea Village Historic Preservation Community is the "spark" for the greater Wailea/Hakalau community in terms of sponsored events and the spirit of cooperation. Stories and shared wisdom of area elders provided the vision for the values and priorities we carry into the future. Read more about historic preservation in Wailea. I wonder if you remember the first time you noticed this message above the door to the Artist's Studio next to the Garage Gallery entrance? Perhaps you were a first time B&B guest on your way to breakfast from Pu'uhonua or Hale Aloha House, a neighbor on your early morning walk past Akiko's, or a "lost" tourist discovering the quiet charms of Wailea Village after wandering off the Belt Highway in search of Kolekole Beach Park or Akaka Falls? Our friend Akiko is clearly rooted to the source and living a life of service we all admire. In addition to founding the non-profit Wailea Village Historic Preservation Community (WVHPC) more than 20 years ago her vision, leadership and energy are constantly creating opportunities and inspiration for each of us to be of service, wherever we are, according to our interests and abilities. to sustain the country lifestyle for the current community and for generations to come. 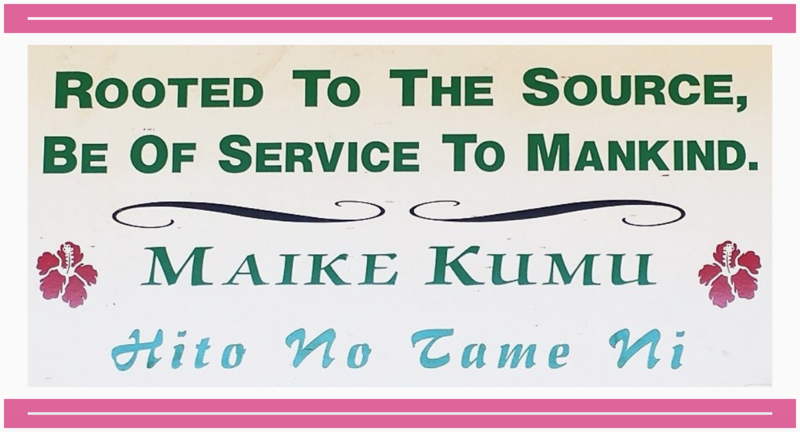 Events initiated and organized through the Community include Cemetery Stewardship, Reviving Hakalau School, almost weekly Senior Luncheons at the Jodo Mission, and the annual Mochi Pounding.